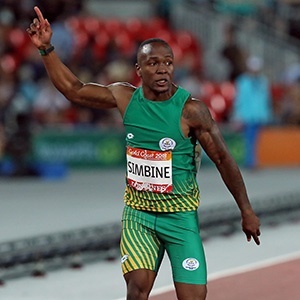 Cape Town - South Africa's top sprinter Akani Simbine will be targeting the 200m at the 2019 Sizwe Medical Fund & 3SixtyLife ASA Senior Track & Field and Combined Events Championships that will take place at Germiston Athletics Stadium from April 25-27. After opening his season in the first leg of the Athletics Grand Prix Series this past weekend in Mangaung by running the anchor leg of the 4x100m, Simbine's coach, Werner Prinsloo confirmed that he is satisfied. "He looked good in the top bend and ran hard. I am happy with where we are in our training right now and the relay was a good leg loosener for him," said Prinsloo. "Akani has a wild card entry into the World Championships 100m courtesy of his Africa title which he won last year. That means we are able to put more emphasis on the endurance element of his sprinting at this time, which is why we are looking at the 200m." Simbine anchored the RSA A-team to victory in Mangaung, crossing the line in 38.88 seconds. The men's 200m heats will start on Friday, April 26 at 10:15, with the semi-finals on the same day at 16:00 and the finals on Saturday, April 27 at 18:15 according to the provisional time table. SA record holder, Clarence Munyai who scorched a 19.69 seconds in the semi-finals of the 2018 National Championships, will be opening his season at the National Championships. A slight niggle prevented the 21-year-old from competing at the Athletics Grand Prix on Saturday and the decision was taken to make sure he would be 100 percent in shape for the Nationals come April 25. Munyai ran a 32.75sec 300m on February 15, giving a good indication that he is coming into form well. "He is looking good at training," said his coach, Hennie Kriel. "We all know he is a fast athlete, so if he stays healthy, then his 200m will be pretty good come the Championships." Luxolo Adams will not relinquish his title without a challenge though. The African 200m bronze medallist has already run a 20.3sec 200m in March this year, albeit a hand time. He won the title in 2018 with a 20.01sec, edging Anaso Jobodwana into second (20.07sec). With US-based former World Championship bronze medallist, Jobodwana on his way back to South Africa for the Championships, the 200m will be a hard race to win.